First Issue of Inside Display Week 2016! Welcome to Inside Display Week 2016 ― designed especially to give you all the latest news about Display Week 2016, to be held May 22-27, 2016, in San Francisco. Next year's event holds even more of what DW is all about: seeing the newest technology before anyone else does. Special areas of focus include the rapid growth of: augmented and virtual reality, digital-signage display solutions, lighting, TFTs and display circuits on flexible substrates, vehicle displays and user-interface technology trends, and wearable displays. With a three-day exhibition featuring global leaders in the display industry and an unparalleled, four-day technical symposium, you won't want to miss it. As if that weren't enough, this year's excitement will take place against the golden backdrop of San Francisco, known for its sights, restaurants and dynamic energy. With Silicon Valley nearby, the possibilities for expanding your horizons are virtually endless. This inaugural edition of Inside DW 2016 includes need-to-know information about the line-up, locale, exhibition, attendance and participation in the must-see event of the year. A number of influential organizations have already committed to showcasing at DW 2016, including LG Display Co., Sharp, Corning, E Ink, Innolux, Merck and Mitsubishi Electric US. See the full list. Learn more about how you can become an exhibitor at the premier display technology event of the industry and see our floor plan. If you're already an exhibitor and have questions, please contact Danielle Rocco, exhibition and sponsorship coordinator, at (646) 226-7592 or drocco@pcm411.com. These sessions will be bringing together scientists, analysts, engineers and marketing professionals to discuss advances from technology to applications and products. Curved, compound curve and flat formats are raising new questions in this arena, and DW 2016 will have the answers. Join these sessions to be illuminated about all aspects of solid-state lighting, with a focus on advances in materials, devices and implementation. This emerging technology has only begun to scratch the surface, but these informative sessions will dig deeper into the field. Ready, set, go to these special sessions covering all aspects of automotive and related HMI issues  from market trends to advanced technologies for displays and touch screens in vehicles. Wearables have emerged as one of the most active fields in the technological world, and this special track will cover all aspects of the fascinating arena of wearable displays  from product and process design to user applications and wearable system integration. 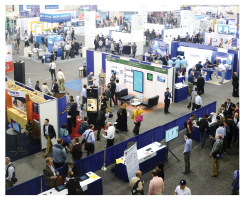 See the latest advancements and products in display technology industry before anyone else. Learn from global leaders about the trends and future of display technology. Understand and gain an edge on the competition. Visit the Innovation Zone to see the emerging technologies that will enable the products of the future. Network with peers, press and industry analysts. Expand your knowledge base with education and training sessions. Take advantage of hands-on access to the latest products, technologies, equipment and services. Generate new leads for strategic alliances and potential customers. Save on yearly travel costs by meeting with multiple partners, potential purchasers, suppliers and clients in one place. It's never too early to start planning your visit to Display Week 2016 in San Francisco. Contact us today about attending or exhibiting. 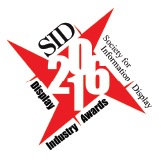 Each year, SID awards gold and silver Display Industry Awards in three categories: Display of the Year, Display Application of the Year, and Display Component of the Year. Submissions should apply to products on sale within the previous calendar year, industry-wide, whether they are being shown at Display Week or not. Self-nominations are encouraged! If you would like to nominate a product that you've simply used and believe has merit, third-party nominations can also be submitted by emailing the product and company name to: drocco@pcm411.com. Nominations are due by Jan. 15, 2016. Last year's winning DIA products included a 65-inch OLED TV panel from LG Display, a liquid-crystal mixture from Merck, and a 5K retina display for the iMac from Apple. Over the years, there has been a huge range of winning products from companies large and small. Make sure we know about your product -- make your nomination today. Known as the City by the Bay, San Francisco is also known as one of the most exciting cities in the world. The Golden Gate Bridge is only the beginning: Its bright lights and buzzing streets hold some of the world's finest restaurants, unique shops, best museums and most stunning architecture that make it a travel destination for foodies, shopaholics, families and  yes  conference goers. Whether you want to see a historical site like Alcatraz or take a trolley car to cruise up and down the city's rolling hills, or just enjoy a stunning view of the Pacific Ocean, San Francisco in the spring is definitely a treat. http://www.inside-guide-to-san-francisco-tourism.com" style="color:#1b75bb; font-size: 16px; line-height: 24px; ">http://www.minitime.com/trip-tips/Insider-Guide-San-Francisco-article" style="color:#1b75bb; font-size: 16px; line-height: 24px; "> http://www.sanfrancisco.travel" style="color:#1b75bb; font-size: 16px; line-height: 24px; margin-bottom: 20px;"> http://www.sanfrancisco.travel. to receive all the latest information from the Society for Information Display. You're receiving this email because you've signed up to receive updates on SID. If you'd prefer not to receive updates, you can unsubscribe. © Copyright 2011-2015 SID - All rights reserved.